2013 Panini Playbook Football shows a brand that's evolving. Shifting more towards veteran content, it opens up lots of new possibilities for the all-hits release. Single-pack boxes come with four cards. Two are book cards, at least one of which is signed. Of the remaining two cards, one of those is signed as well. 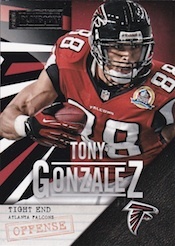 As the name and configuration suggest, booklets are the driving idea behind 2013 Panini Playbook Football. Playbook Booklet Signatures mark the first veteran autographed memorabilia book cards for the brand. The cards include an autograph and a jumbo swatch on one side. The other has a second memorabilia piece and a die-cut player image. Parallels include one-of-one Printing Plates, Nike Swoosh and NFL Shield versions. 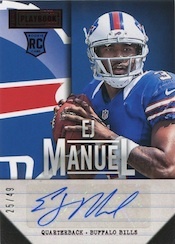 Rookies Booklet Signatures follow a similar dual-memorabilia format. The checklist includes the 40 players from the NFLPA Rookie Premiere. 2013 Panini Playbook Football has a few new book cards as well. Flywire Booklets take the distinct material and NFL shield from the jersey collar and embed them into a three-panel card. Playbook Coaches Signature Booklets highlight some of the greatest play callers in the history of the NFL. Down & Dirty Booklets push clean swatches to the side. Swatches used on these cards are have plenty of grime and grass stains. Rookie-Drawn Play Booklets feature plays drawn by Rookie Premiere attendees. And while the release is big on book cards, there are some traditional cards as well. These include Base Signatures that have multiple color-based parallels. 2013 Panini "Rookie Playbook" Brandon Weeden Autograph 8 Piece Jsy Card#2. 2013 Playbook Auto RC SICK Patch Gold #4 49 Cordarrelle Patterson Patriots HOT ! why do we have to wait until 3 days after a product comes out to get a full and complete checklist??? It seems ridiculous to me…. I agree. I just bought into 2 case breaks 5 teams each not really knowing what is possible. Oh well. I just know that last year Playbook, alot of the group sites use pictures of cards to sell the break, and many had a picture of a Jerry Rice “Accolades” autograph for SF 49ers, well that card never existed apparently, it wasn’t on the checklist, Don’t the card companies have this stuff figured out like months before release? bwoogie � They release mock-ups in advance. Often, sets are not 100% finalized until just before release. Did break 1 with 49ers and Broncos. 7 nice hits… product looks incredible. Every box had at least 1 #/25. And at least 2 top rookie pieces. I look forward to Playbook every year, wish it looked this nice with the 2012 rookie class. I love these cards from panini. They are great cards. I am 13 and been collecting NFL football cards for awhile. 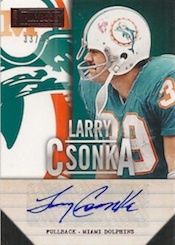 I have been looking for autographed cards,jersey cards and communtive patches. But can’t find any. I am a really big Chicago bears fan. Thank you Panini for making great NFL football cards. Very detailed and just awesome. Very cool cards. Pulled a # to 10 & 3 booklets including a Ditka Coaches playbook. I would definitely by another 13 before I purchase a 14.